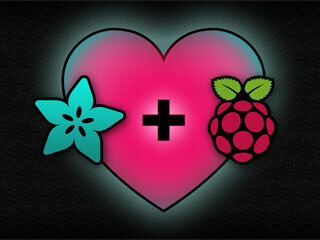 Is this not the cutest, little display for the Raspberry Pi? It features a 3.5" display with 480x320 16-bit color pixels and a resistive touch overlay, but is only slightly larger than our popular original. The plate uses the high speed SPI interface on the Pi and can use the mini display as a console, X window port, displaying images or video etc. Best of all it plugs right in on top! It's designed to fit nicely onto the Pi Model A or B but also works perfectly fine with the Model B+ as long as you don't mind the PCB overhangs the USB ports by 5mm. Best of all, it comes fully assembled and ready to plug into your Pi! You can use this as a display for running the X interface, or pygame. You can also have an HDMI display seperately connected. This procedure is identical for the 2.4", 2.8", 3.2" and 3.5" Resistive PiTFTs. Not for use with the Capacitive PiTFT! Now that the screen is working nicely, we'll take care of the touchscreen. There's just a bit of calibration to do, but it isn't hard at all. Before we start, we'll make a udev rule for the touchscreen. That's because the eventX name of the device will change a lot and its annoying to figure out what its called depending on whether you have a keyboard or other mouse installed. which will let you see touchscreen events in real time, press on the touchscreen to see the reports. Try using this default calibration script to easily calibrate your touchscreen display. Note that the calibration values might not be exactly right for your display, but they should be close enough for most needs. If you need the most accurate touchscreen calibration, follow the steps in the next section to manually calibrate the touchscreen. follow the directions on the screen, touching each point. Using a stylus is suggested so you get a precise touch. Don't use something metal, plastic only! You should see five crosshair targets. If you see less than that, the touchscreen probably generated multiple signals for a single touch, and you should try calibrating again. which will let you draw-test the touch screen. Go back and re-calibrate if you feel the screen isn't precise enough! You must be running PIXEL (the GUI) while calibrating. Note that the geometry may vary! If you are using a 2.4"/2.8"/3.2" 320x240 display with landscape orientation, use 640x480. If you're in portrait, use 480x640. Option "TransformationMatrix" "-0.000087 1.094214 -0.028826 -1.091711 -0.004364 1.057821 0 0 1"
or whatever you got, into there. Your touchscreen is now super calibrated, hurrah! you can also edit it by putting the SD card into a computer and opening the same file. fbcon=map:10 fbcon=font:VGA8x8 then save the file. On the next boot, it will bring up the console. Note that the kernel has to load up the display driver module before it can display anything on it so you won't get the rainbow screen, a NooBs prompt, or a big chunk of the kernel details since the module is loaded fairly late in the boot process. You may notice the console goes black after 30 minutes, this is a sort of 'power saving' or 'screensaver' feature. sudo sh -c "TERM=linux setterm -blank 0 >/dev/tty0"
The Ideal: Adafruit’s PiTFT displays are razor sharp. 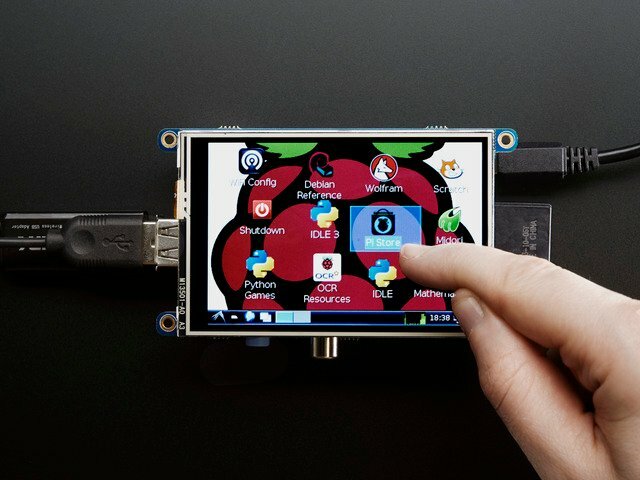 Whereas small composite screens on the Raspberry Pi usually require some video scaling (resulting in blurriness), PiTFT uses the GPIO header, digitally controlled pixel-by-pixel for a rock steady image. Though not a lot of pixels, it works great for retro gaming (and the display neatly stacks above the board, no side protuberances for video cables). The Downside: this GPIO link entirely bypasses the Pi’s video hardware, including the graphics accelerator. Many games and emulators depend on the GPU for performance gains. So the PiTFT has traditionally been limited to just a subset of specially-compiled emulators that can work and run well enough without the GPU. The Solution: our latest PiTFT drivers, along with a tool called fbcp (framebuffer copy), careful system configuration, and (optionally) the more potent Raspberry Pi 2 board open the doors to many more gaming options. Existing emulator packages (such as RetroPie, with dozens of high-performance emulators and ports) — previously off-limits to the PiTFT — can run quite effectively now! Click here to go to our FBCP tutorial! The backlight of the 2.8" PiTFT has 4 LEDs in series and it draws ~75mA at all times, controlled by a transistor. The PiTFT 3.5" display has 6 LEDs in a row, and we use a boost converter to get the 5V from the Pi up to the ~20V needed to light up all the LEDs. There might be times you'd like to save some power and turn off the backlight. The screen and touchplate will still work, you just can't see anything. We designed the board with the STMPE610 touchscreen controller which has 2 extra GPIO and tied one of them to control the backlight. You can use the command line to control the backlight. By default, the backlight's on...but you can control it in two ways! If you want precise control, you can use the PWM output on GPIO 18. There's python code for controlling the PWM but you can also just use the kernel module and shell commands. You'll need to make sure the STMPE control is not 'active' as the STMPE GPIO overrides the PWM output. sudo sh -c "echo 508 > /sys/class/gpio/export"
sudo sh -c "echo 'out' > /sys/class/gpio/gpio508/direction"
sudo sh -c "echo '1' > /sys/class/gpio/gpio508/value"
sudo sh -c "echo '0' > /sys/class/gpio/gpio508/value"
If you want to double-click on icons to launch something in X you may find it annoying to get it to work right. In LXDE you can simply set it up so that you only need to single click instead of double. Obviously if you have a touchscreen, it cannot tell what finger you are pressing with. This means that all 'clicks' are left clicks. But if you want a right-click, you can do it. Option "Calibration" "3800 120 200 3900"
This makes a right mouse click emulated when holding down the stylus for 750 ms. Unfortunately xstroke hasn't been actively maintained for a few years so there isn't a binary package you can directly install. However compiling the tool is straightforward and easy with the steps below. Credit for these installation steps goes to mwilliams03 at ozzmaker.com. If the commands above execute successfully xstroke should be installed. If you see an error message, carefully check the dependencies above were installed and try again. To use xstroke I highly recommend using a plastic stylus instead of your finger. Also calibrate the touchscreen for X-Windows so you have the best control over the cursor possible. Don't use a ballpoint pen or sharp metal stylus as it could scratch or damage the touchscreen! Start X-Windows on the PiTFT and open the LXDE menu by clicking the icon in the lower left corner. Scroll up to the Accessories menu at the top and notice the new XStroke and XStroke Kill commands. Click the XStroke menu option to start xstroke. You should see a small pencil icon appear on the bottom right side of the screen. The pencil icon means xstroke is running, however by default it's not yet looking for gesture input. Open an application that takes text input, such as LXTerminal. To enable gesture input click the xstroke pencil icon. You should see the pencil turn green and the text 'abc' written over top of the icon. You might need to click the icon a few times to get the click to register in the right spot. To draw a gesture from the above image, press anywhere on the screen, start from the circle in the gesture, and follow the gesture pattern towards the arrow. As you draw a gesture you should see a blue line displayed that shows what you've drawn. Lift up the stylus when you get to the end of the gesture at the arrow. If xstroke recognizes the gesture it will send the appropriate key press to the active window. Try drawing a few characters from the image above to get the hang of writing gestures. A few very useful gestures are backspace (which deletes a character), return/enter, and space. To draw a backspace gesture just draw a line going from the right side of the screen to the left side. The gesture for return/enter is a diagonal line from the top right to bottom left. Finally a space is a straight line from the left to the right. Note that when xstroke is looking for gestures you might not be able to click or control the cursor as you normally would expect. To stop xstroke's gesture recognition carefully press the xstroke pencil icon again until the 'abc' text disappears. I've found this process can be a little finicky as the icon is very small and any movement will be interpreted as a gesture. Use a light touch and try a few times to click the icon. If you get stuck completely and can't disable xstroke by clicking the icon, connect to the Raspberry Pi in a terminal/SSH connection and run 'killall xstroke' (without quotes) to force xstroke to quit. The normal way to stop xstroke is to navigate to the Accessories -> XStroke Kill command, but you might not be able to do that if xstroke is listening for gesture input. 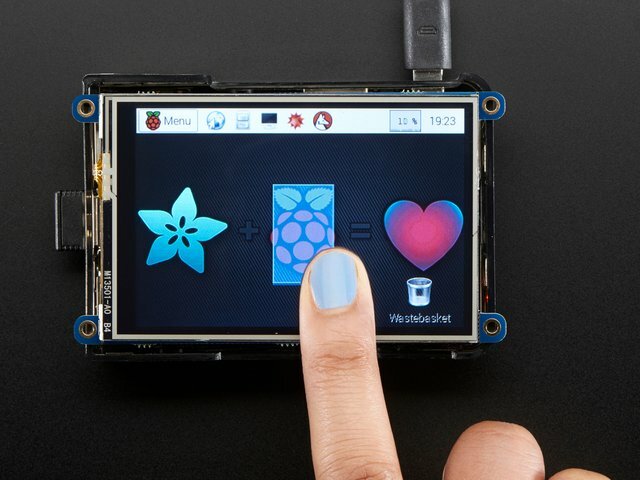 Have fun using xstroke to control your Pi by writing gestures on the PiTFT screen! Since the PiTFT screen is fairly small, you may need to write custom UI programs. Pygame is the easiest way by far to do this. Jeremy Blythe has an excellent tutorial here on getting started. My PiTFT used to work, now it doesn't! If you messed with /boot/config.txt or /etc/rc.local you may have removed or disabled some of the elements required for the PiTFT to work. Try re-running the Easy Installer script! I'm booting my Pi with the PiTFT and the HDMI output 'locks up' during boot! It looks like the Pi is 'halting' or 'locking' up during boot but what is really happening is the console is switching from the HDMI output to the PiTFT console output. Check your PiTFT connections, particularly make sure you seated the PiTFT on the Pi properly, nothing is in the way, and the TFT flex connector is seated properly. I'm tring to run startx and I get FATAL: Module g2d_23 not found. don't forget you have to remove the turbo file! How come OMX-Player and Minecraft and other programs don't appear on the PiTFT display? Why doesn't the tactile button on GPIO #21 work? On some older PiTFTs we had one of the buttons labeled #21 - that's the original RasPi name for that pin. If you're using a V2 (chance is, you are!) that is now called #27. I want better performance and faster updates! You can tweak fps (frames per second) from 20 to 60 and frequency up to 62MHz for tradeoffs in performance and speed. Reboot after each edit to make sure the settings are loaded properly. There's a trade off that if you ask for higher FPS you're going to load the kernel more because it's trying to keep the display updated. How can I take screenshots of the little screen? How do I automatically boot to X windows on the PiTFT? On my first run of startx I get a window saying "GDBus Error.org.Freedesktop Policy Kit1 Error: Failed Cannot determine user of subject"
This happens on the Raspberry Pi the first time you run startx, no matter what display. You can just re-start X and it wont appear again. Can I get a right-click from the touch-screen? Here's a hack for the device tree overlay that can force different SPI modes, sometimes that helps! If you do have a 40-libinput.conf in that same directory, you must remove it even if/once evdev is installed, since it will override the 10-evdev.conf otherwise. Thanks to cerebrate in the forums for the hint! Layout and Schematic for PiTFT Plus 3.5"
Layout and Schematic for original PiTFT 3.5"
This guide was first published on Sep 17, 2014. It was last updated on Sep 17, 2014.